Corsair has announced a new color option for the RMx series power supplies, Arctic White. Readers with a watchful eye may remember that a while ago the company brought out a special edition of the RM1000i PSU in white. Now by popular demand, Corsair has made this a standard option for two of their PSUs, the RM750x and RM850x. The newly redecorated power supplies are otherwise identical to their existing black-painted counterparts. This means they have fully modular cabling which can minimize the amount of wires users need to use, and see, in their cases allowing for a cleaner look. The cables come already individually sleeved in white with black connectors using three layers of paracord for each. Also something of note, one will find in-line capacitors on the ATX, EPS12V, and PCIe cables which Corsair says helps reduce ripple and noise, and improve voltage regulation. Features of the RMx series include a Zero RPM Fan Mode, where the rifle bearing 135mm fan sit idle during light to medium loads, only spinning up with heavy loads or at a specific temperature. On top of that The RMx line carries an 80 Plus Gold certification for efficiency, uses 100% all Japanese capacitors rated to 105C, and provides owners with a long 10 year warranty. The Artic White versions will fetch a $10 premium over the traditional charcoal/black RMx models. They are priced at $149.99 for the RM750x and $169.99 for the RM850x at the Corsair Website. 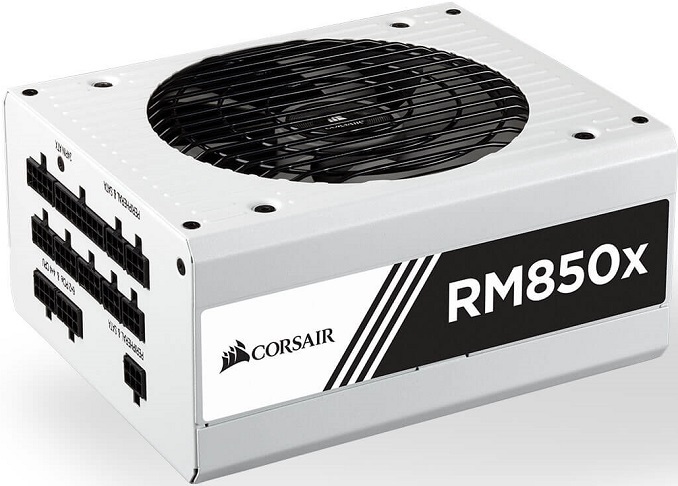 Finally, Corsair is also stating that at least for now, this is it for white RMx PSUs; there are no plans to produce the lower wattage RMx series power supplies in white.